I remember sitting down with a coworker at the Subway on 5th Avenue in San Diego’s Gaslamp Quarter after a night shift back in 2005. Our conversation was basically about traveling, and the memories from my first European trip the previous year were still quite fresh. At some point we started talking about the cities I didn’t get to visit on that trip. I forgot all of the names I dropped except for one: Lübeck. Guess I never forgot it because I spent a few minutes explaining to my colleague how to pronounce the name of the city, which is also probably why I remember this rather random episode. There are so many cities in Germany that are worth visiting that it is hard at times to choose where to go. To make matters worse, there are so many awesome cities in other countries that are but a short drive or flight away that sometimes it’s hard to get around to visiting cities you’ve had your eye on for a while. Basically that’s why I never got to visit Lübeck until now. As you probably know, before moving to Hamburg I spent almost eight years in Heidelberg and Berlin. The distance from Heidelberg to Lübeck is almost 600 kms, and to Amsterdam or Prague roughly 500 kms. When I lived in Berlin I always figured I could just go on short trips to Poland or discover more of the former East Germany. Now that I live in Hamburg I’m beginning to see more of Northern Germany, and the first city I needed to visit was Lübeck. 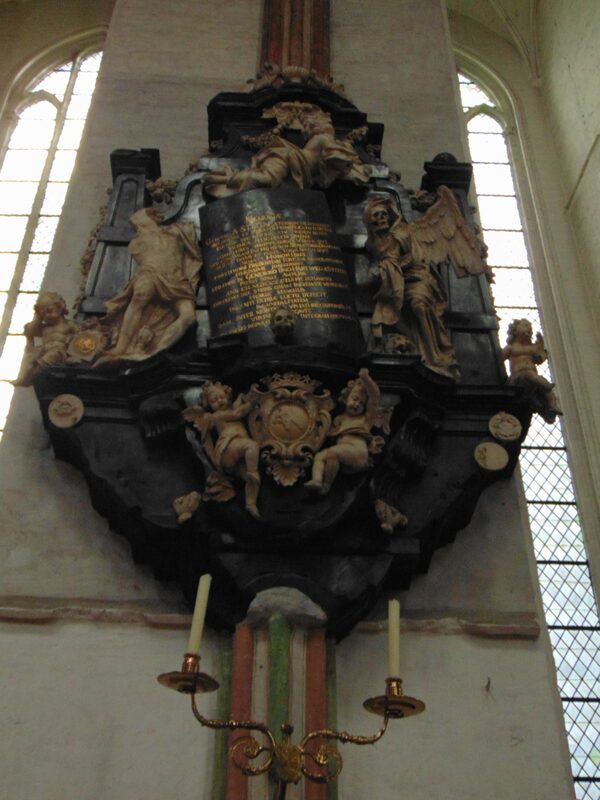 Lübeck always interested me because of its history, which is marked by both success and tragedy. 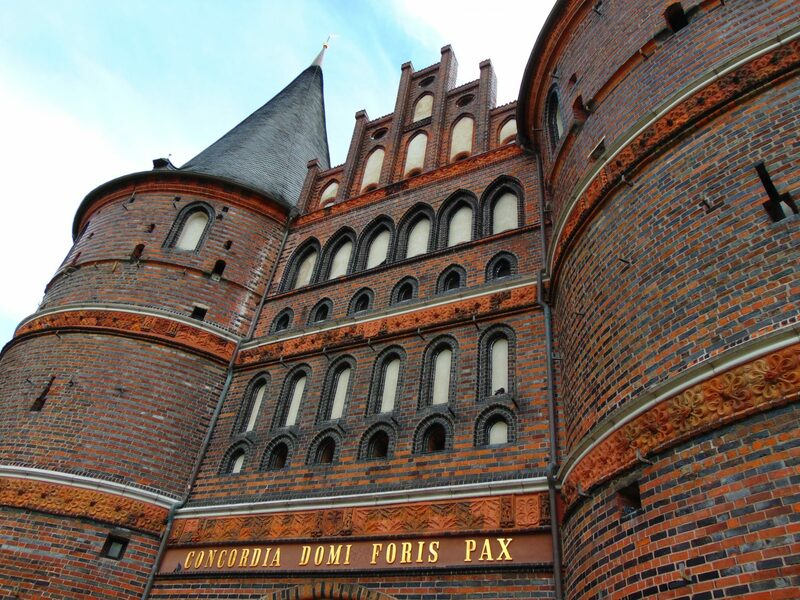 A powerful city-state for most of its existence, Lübeck was also the most important member of the Hanseatic League, a commercial alliance of cities spanning across the Baltic and North seas. 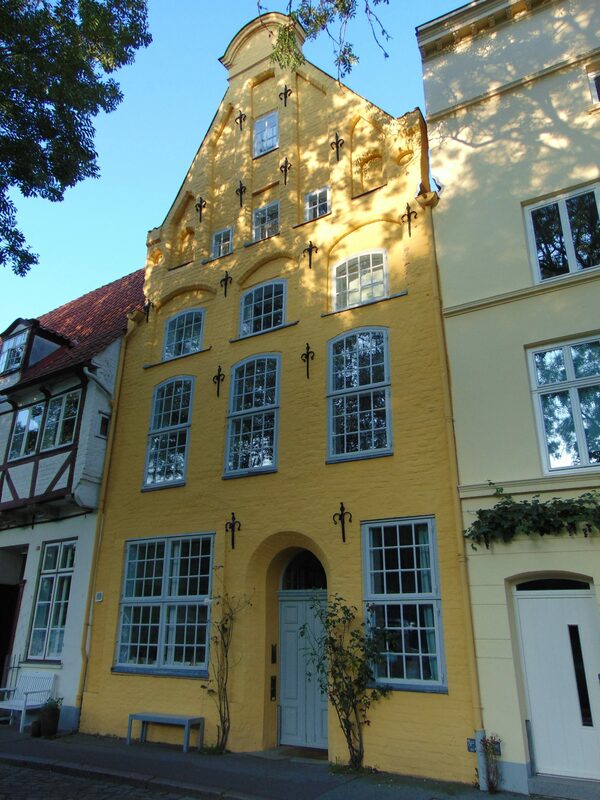 Other Hanseatic cities include Hamburg, Stockholm, Kaliningrad (known back then as Königsberg), Riga, and Tallinn, and if you’ve visited at least two of those cities you’ve most likely observed some similarities in the architecture. 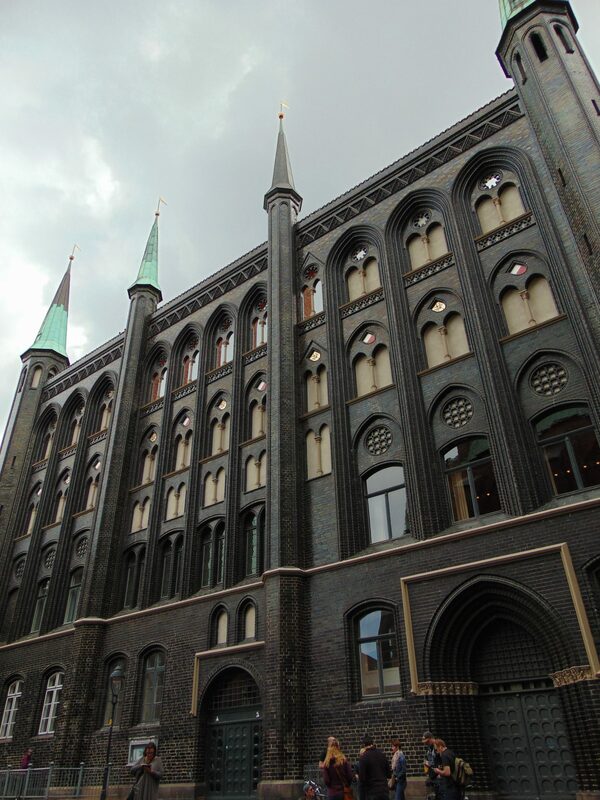 That’s because the Hansa League also left its cultural and architectural print in Northern Europe. 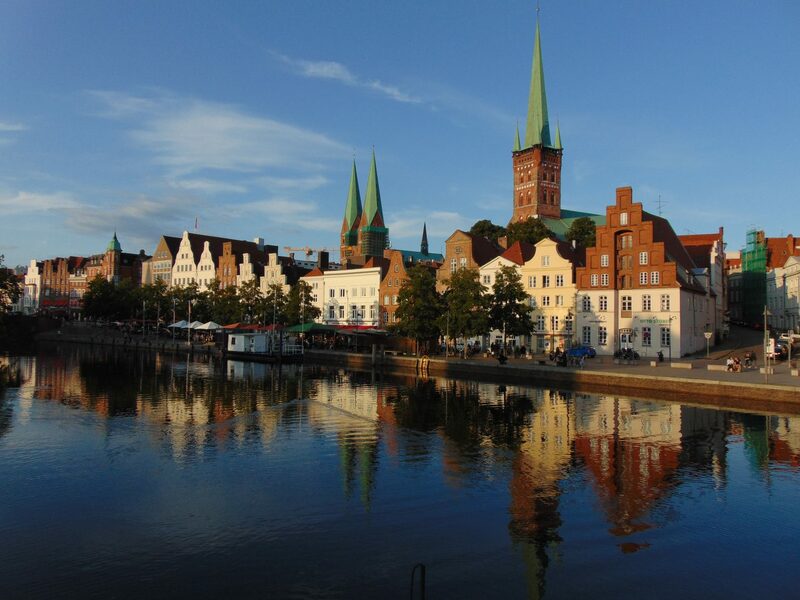 A walk through Lübeck will evoke memories of cities like of Tallinn or Gdansk, with red brick Gothic churches towering over the city, and thin, tall merchant houses tightly packed against one and other. 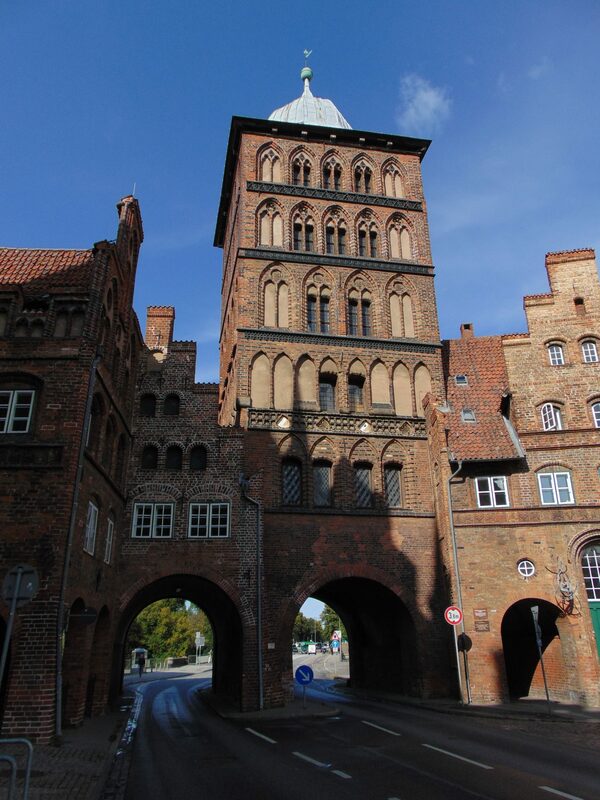 That Lübeck was the center of the Hanseatic League is clear in the city’s architecture, which is lavish and imposing and bespeaks affluence. 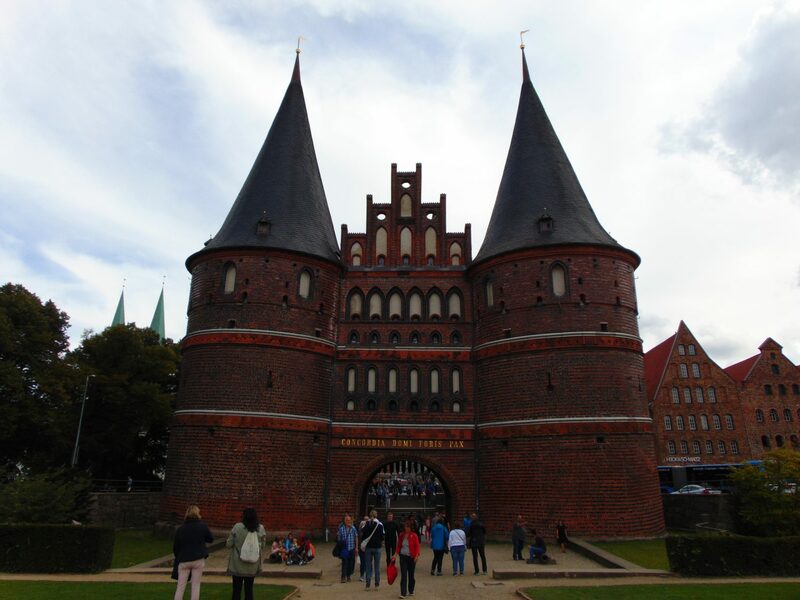 Lübeck, formerly known as “Queen of the Hansa,” truly is a medieval wonderland. 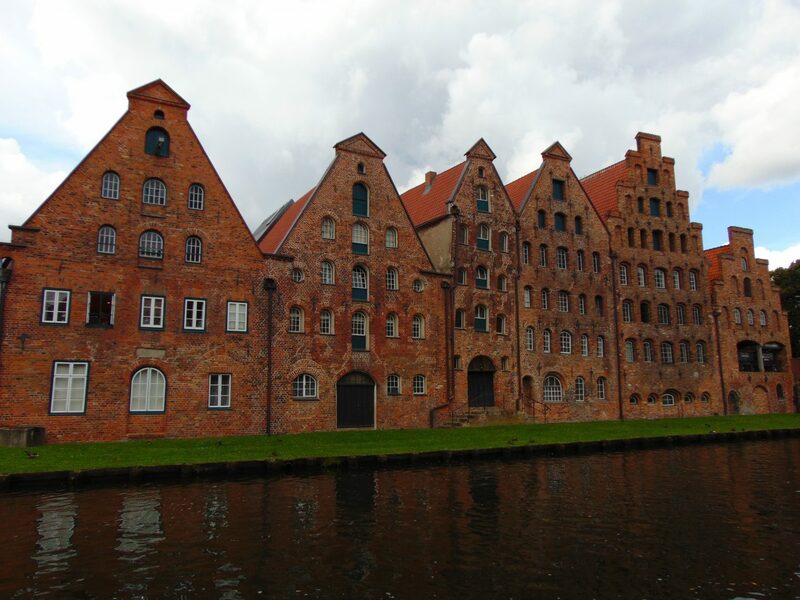 Lübeck lost gradually lost its importance as a modern trading center to neighboring Hamburg. However, it was thanks to this that Lübeck was able to maintain its distinctive medieval character—which Hamburg on the other hand lost. 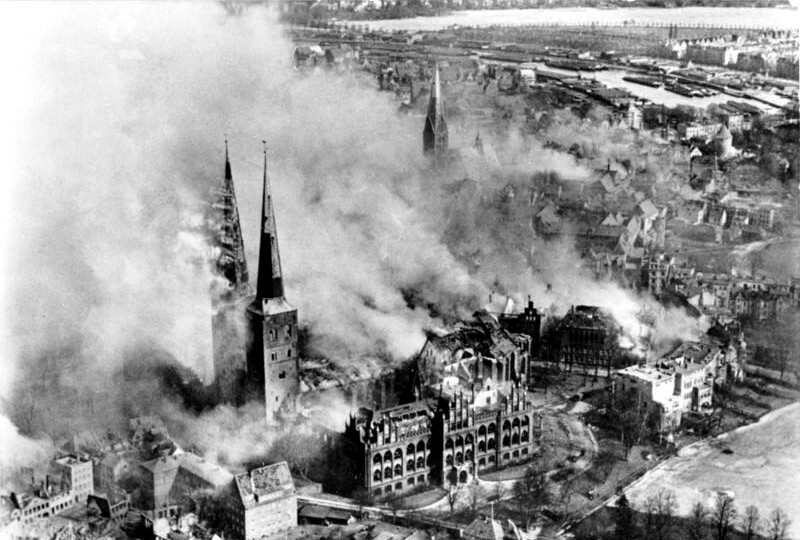 It is at times hard to believe that Lübeck was the first German city to suffer the wrath of Britain’s Royal Air Force: On the night of March 28, 1942, British bombers flew over Lübeck, dropping its deadly payload mostly in the city center according to the Area Bombing Directive, which authorized the destruction of civilian areas in an attempt to demoralize the enemy. The bombing of the city left death and widespread destruction in its wake. Some of Lübeck’s architectural landmarks, such as the Cathedral or St. Mary’s Church, were reduced to mere charred husks. A lot of irreplaceable items were lost forever during the raid, such as Bernd Notke’s Totentanz. The painting, which depicts the Danse Macabre, or Dance of Death, was housed in St. Mary’s church but was burnt together with the rest of what was inside the building. Lübeck suffered a lot during the war. However, what was damaged has since been meticulously rebuilt to mirror city’s former glory—at least to an extent. 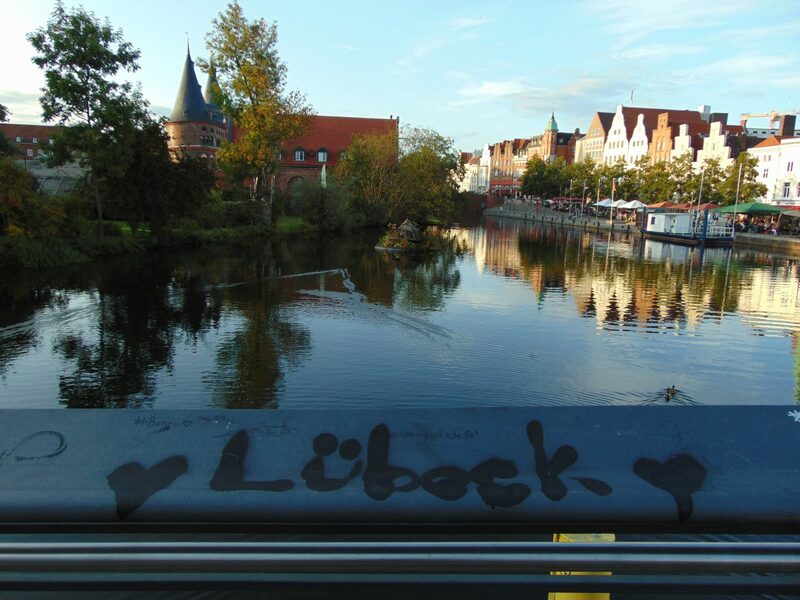 To make matters more interesting, Lübeck was also directly on the border to the former East Germany. The train ride from Hamburg to Lübeck is only 40 minutes, with trains leaving every hour from the main train station. 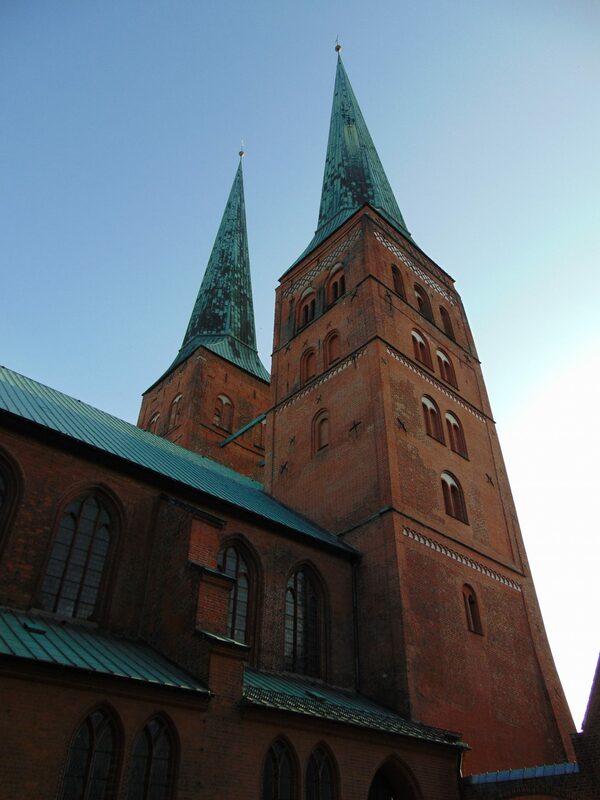 Upon arriving in Lübeck I first walked in the opposite direction to the city center to see St. Lorenz church. I was interested in taking a look at the Plague Cross that stands outside. I then walked around briefly in the cemetery behind the church but didn’t stay long since I wanted to make the most out of my time in the city. 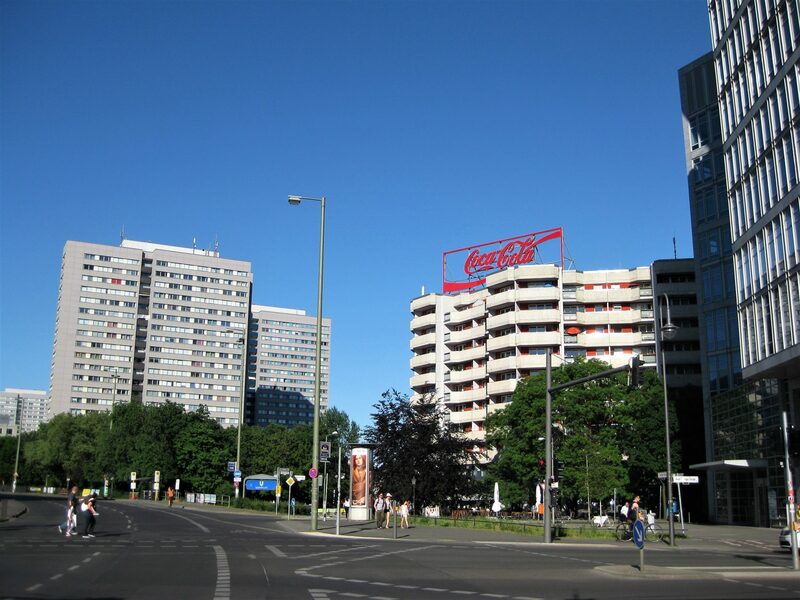 Not far from the train station is the Holsten Gate, which is where the city center begins. 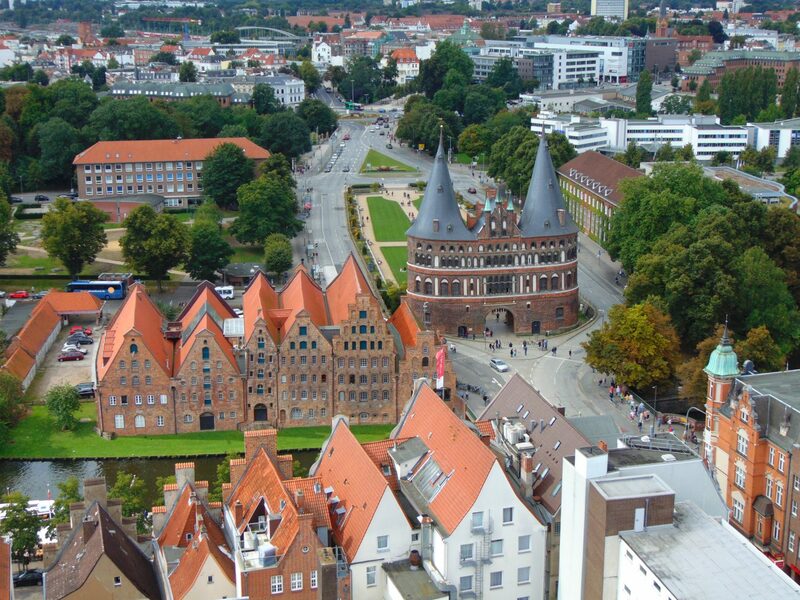 Lübeck’s city center is built on an island on the Trave river and was formerly completely walled. The Holsten Gate was the main entrance to the city center, and thus is particularly imposing. The sheer size of the gate is overwhelming, but I guess the main medieval trading center in Northern Europe deserved no less—especially since Lübeck could definitely afford to build such fortifications. 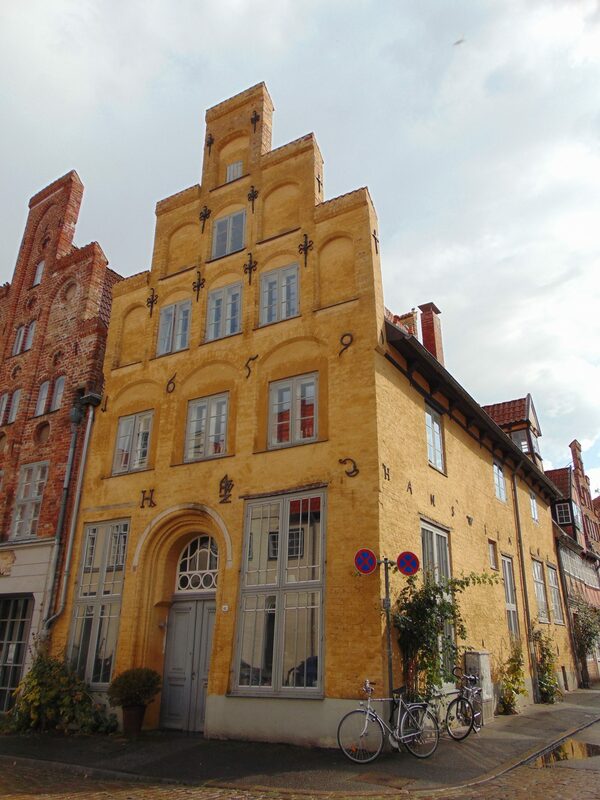 Next to the Holsten Gate are the Salzspeicher, a group of small brick houses formerly used to store salt. The first stop was the viewing point on top of St. Petri’s church. It offers a commanding view of the city, and looking at Hanseatic city centers from atop a tall building is always a treat. 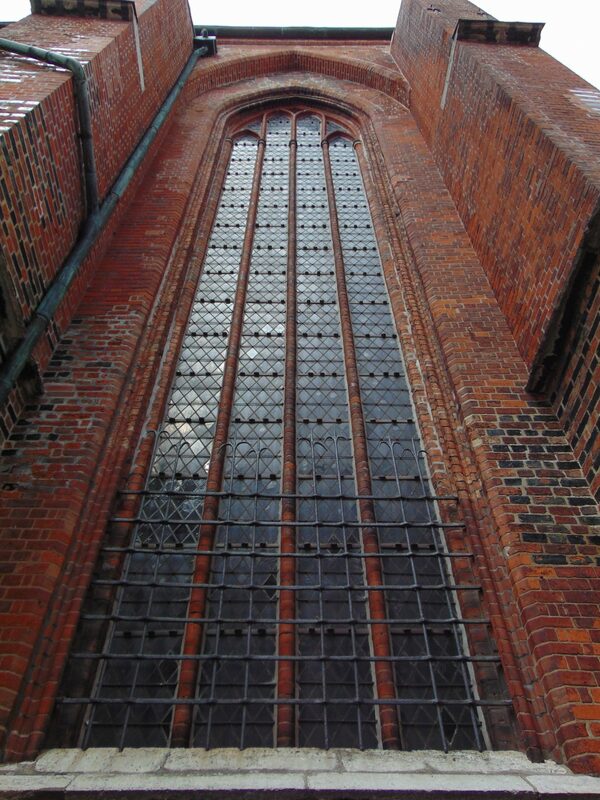 St. Petri’s church was also destroyed during the air raid from 1942 and was only partially restored. Its interior was completely painted white and the church is now used as a venue. A sign at the door announced an upcoming Jazz concert, and since the building has incredible acoustics I bet concerts there are quite an experience. I also wanted to visit the aforementioned St. Mary’s church. 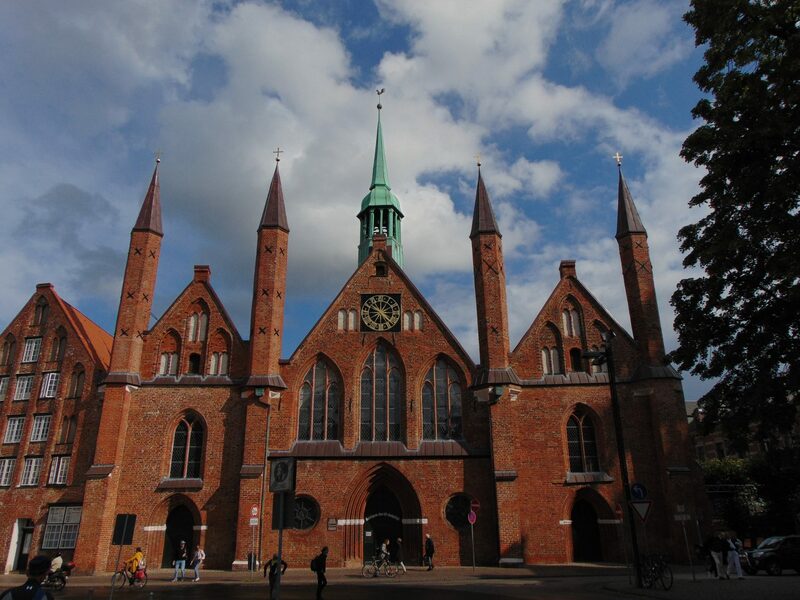 A victim of British bombs, the Marienkirche stands out among the churches in Lübeck. As I said, what I would have really liked to see, the Dance of Death, was destroyed by fire. 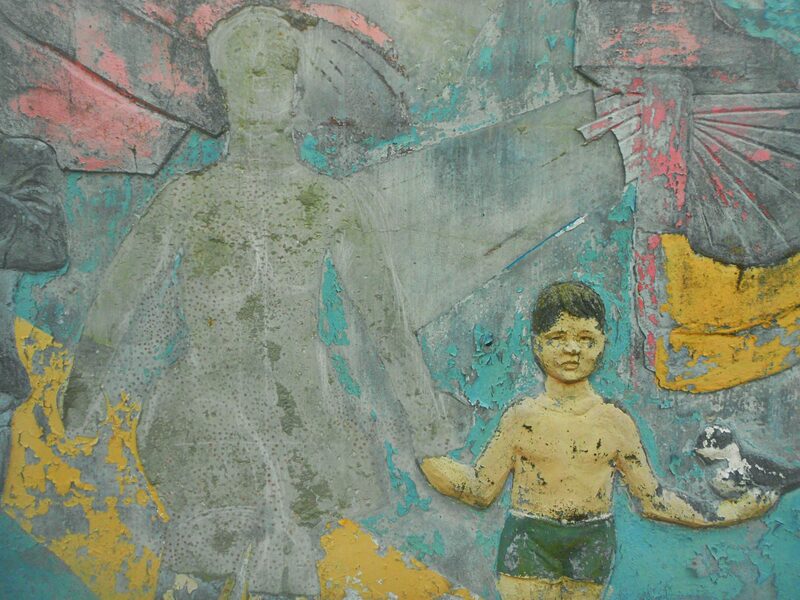 The fire, however, also laid bare old medieval frescoes which had been painted over. An artist was commissioned to restore them, but he took the opportunity to paint his own frescoes instead. 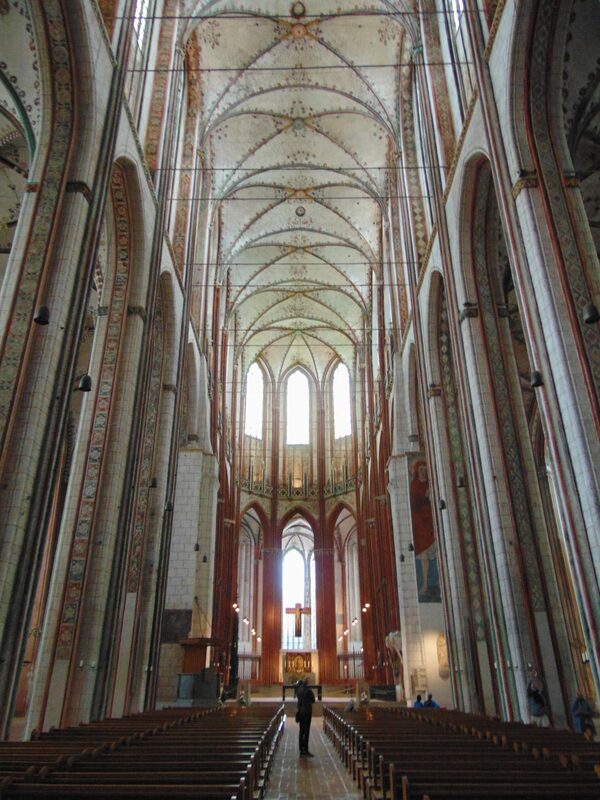 At any rate, the interior of St. Mary’s church is incredibly colorful and majestic. 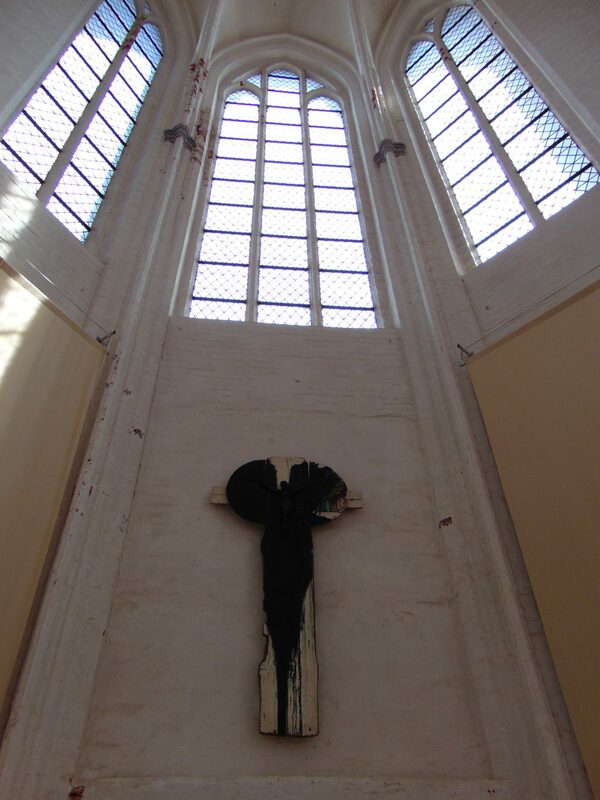 In contrast, the walls are decorated with several depictions of Death, which gives the church a rather unique feel—especially since you can also see remnants of its destruction, such as the church’s old broken bells. There’s also a curious folkloric tale surrounding St. Mary’s church: They say that the devil was tricked into helping to erect the church by being told the building was to house a winery. In 1999, a little statue of the Lord of Darkness was placed outside of the cathedral. 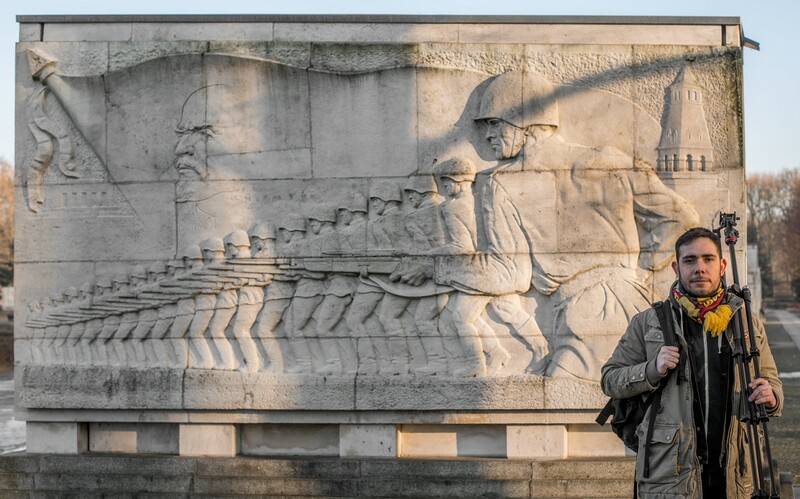 While the statue is not of any particular artistic or historic value its still nevertheless a cool little detail. Across the church is the Town Hall with its pristine black brick facade. I didn’t go inside but you can get a guided tour of the building. Guess I’ll probably have to go for it next time I’m in Lübeck. 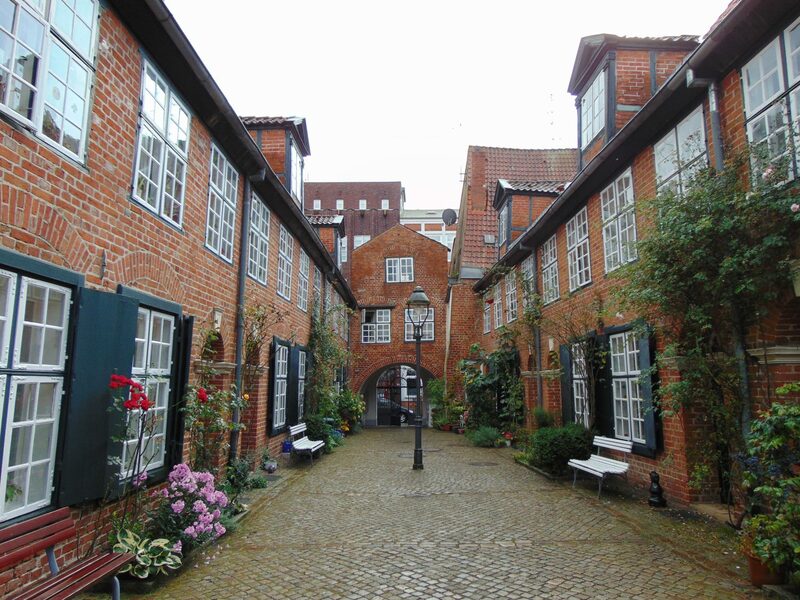 Lübeck has another treat for its visitors: the Gänge, or passage ways. 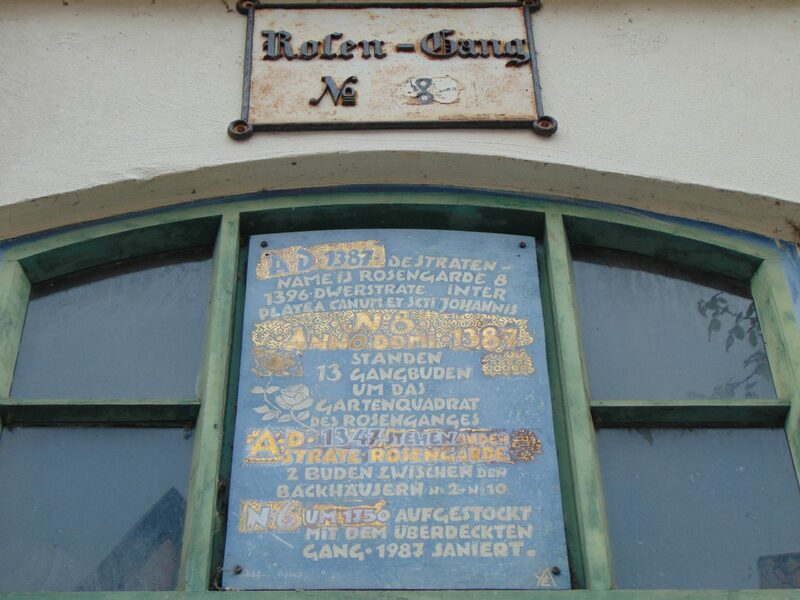 While walking around in the city, pay attention for little white signs between buildings that say “Gang.” Those passages lead to yards with old living quarters. Now restored and probably very expensive, the houses there are a serious throwback to another era. There are no sidewalks, houses are packed even tighter together, and streets, if there are any, become narrow alleyways. These yards are not private property, which means you can simply walk there like you would on any other open street. However, since people live there and the space is so close, visitors are not welcome after 7 p.m. Most passages should be highlighted on any map of the city. I got a free map from a fish & chips joint and there were many on it but I bet there’s many more. I walked from one side of the city center to the other. On of end of the city is the Burg Gate. As always, getting out of the walled city center and see the fortifications from outside is something I recommend, as they usually are even more impressive on the other side. The preserved portion of the wall around the Burg Gate is massive, and below the bridge that crosses the river there’s a little space next to a bridge where you can have a quiet lunch if the weather is good. 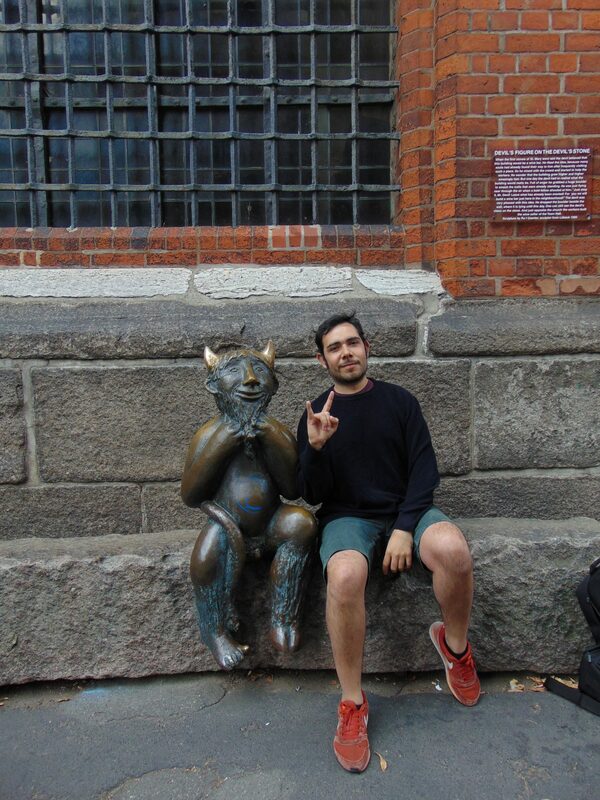 All in all, Lübeck is really worth visiting. 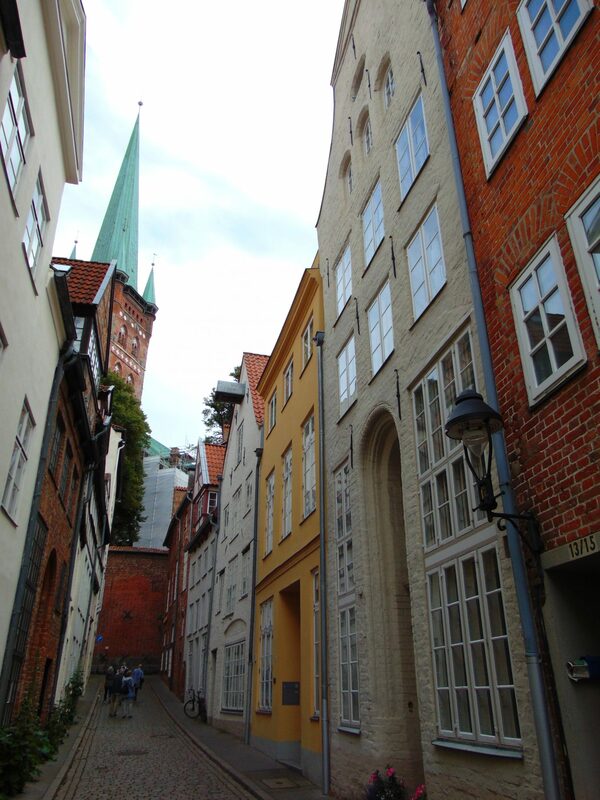 It is a city with the particular Hanseatic medieval flare of the Baltic. Should you visit Hamburg plan to stay a day longer and go to Lübeck. Visiting the city is definitely doable as a day-trip. I myself will definitely go back sometime this month as there are a few sights, mostly outside of the city center, that I still want to visit. Being that I’m privileged enough to call Hamburg home right now, I figured I would just allow myself some more time to discover what Lübeck has to offer and dedicated my first visit to the city’s UNESCO-inscribed center.